Nikki Kastner earned a bachelor’s degree from Western Michigan University where she also earned a master’s degree in Early Childhood Education. This is her 25th year of teaching in a Catholic school. Mrs. Kastner’s favorite thing about teaching is watching the children grow and gain more confidence in themselves by experiencing success. The smile she sees when they have reached their goal is amazing to her! She also loves teaching in a Catholic School so she can share her spirituality and faith with her students. 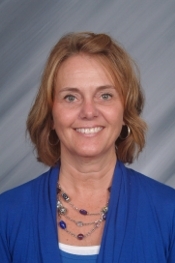 Mrs. Kastner attends Holy Redeemer Parish in Jenison. Mrs. Kastner lives in Jenison with her husband Ken. She has two grown children, Kevin and Katie, who are both studying to be teachers. Mrs. Kastner comes from a long line of teachers including her great-grandmother, grandmother, aunts, uncles, and both parents! What a great year we are going to have! Cursive writing, multiplication and division, animal reports and learning all about the state of Michigan. Newsletters with weekly updates, information and homework will be sent via email through Infinite Campus.